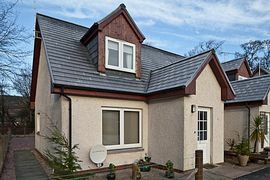 Auchenrowan is a modern semi-detached villa set in quiet location on the fringes of Lamlash village on the beautiful Isle of Arran. 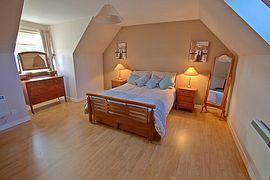 The property sleeps four in a twin bedroom and a spacious master double, plus there is room for a cot or a toddler in a put-up bed. 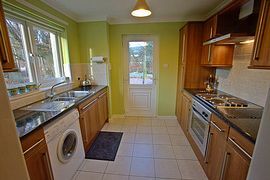 A comfortable lounge-diner, modern kitchen and family bathroom (bath with shower over) complete the accommodation. Outside is off-road parking and a compact garden with seating and burn views. 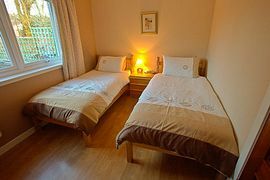 Bed linen is included and towels available at a small charge. Apart from the master bedroom, all the facilities are on the ground floor, making the property suitable for the less mobile visitor. 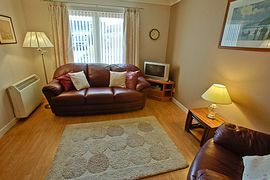 Lamlash village centre is a short walk away, with all local amenities. Hill walking trails start close by and a foot-passenger ferry offers trips to Holy Isle in Lamlash Bay. Lamlash itself is an ideal base for exploring Arran, being centrally located on the eastern coast. Suitable for the less mobile. Auchenrowan is located at the south end of Lamlash village. From the ferry terminal at Brodick proceed south 3 miles on the A841 to Lamlash. Enter the village and continue past the village centre, Church, School and Police Station. The main road crosses a small burn and immediately afterwards, turn right into Glencraig Place, opposite the Fire Station. Auchenrowan is number 10, located at the end of the cul-de-sac to the left, facing east. Varies through the season from: £345 to £495.